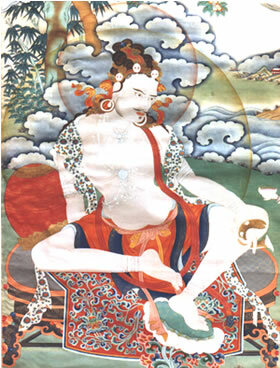 Tilopa is one of the most authoritative and renowned Indian mahasiddhas and masters of mahamudra and tantra. He received various tantric teachings and unified them and transmitted to his disciple, Naropa. Tilopa was the first human master of the Kagyu lineage. Tilopa, known as Prajna Bhadra, was born in the town of Chativavo (Chittagong, which is now in Banladesh), into the Brahmin caste. His birthplace is also recorded to be Jagora (in eastern Bengal, India?). His father was Pranyasha and mother, Kashi. When he grew up he learned all the doctrinal treatises of Brahminism. While he was wandering in various places asking for alms, he finally came to a temple and, seeing that the monks lived a life of renunciation, he entered the monastic life and became a learned in the Tripitaka, the three collections of the teachings of the Buddha. He was empowered into the tantric mandalas by his master, and learned acharyas, and engaged very diligently in meditation practices on those instructions at different places, such as Somapuri. After a short time, he had a unique experience and great wisdom was born within him from this realization. He received further teachings from different persons and had many sacred visions and made great accomplishments over the years. Tilopa received teachings and transmissions especially the “Four Special Transmission Lineages” from great tantric masters of India. Among his many masters, the Great Brahmin Saraha, Acharya Nagarjuna, and Matangi played very important roles in his development. For 12 years, Tilopa devoted himself totally to his practices and attained realization. It is also said that from ultimate point of view, Tilopa had no human teachers and he received the full mahamudra and vajrayana transmissions directly from Buddha Vajradhara. According to Taranatha, Tilopa practised with a ksetra yogini, the daughter of a sesame seed pounder, and the monks expelled him from the monastery. Because he was a former Brahmin Pandita and Buddhist monk, he had lost all his opportunities for wealth and fame. He pursued the work of a sesame seed pounder in the town. He then came to be known as “Tillipa,” the sesame pounder. He received various teachings from dakinis in the land of Oddiyana. He then continued to pound sesame seeds in Oddiyana until the sesame became like a butter broth. Through the methods that he received from his Guru’s instructions, his body and mind was also pounded and synchronized through this process, until he realized the co-emergent wisdom. He also worked at a brothel for Dharima, a prostitute, in Bengal, as instructed by his guru Matangi. He attained great mahamudra realization through practicing in this situation. Through such diligence and skilful practice of mahamudra and tantra, he finally attained the complete siddhi or accomplishment. Tilopa then started to teach and benefit sentient beings for many years. He started to pass on what he had realized, in the form of a song to the gatherings in towns. At first, everyone was usually full of doubt. Hundreds of thousands of people came to see the acharya in a town in Bengal on one occassion. Tilopa appeared with his consort in the sky pounding sesame seeds. When each person in the audience asked questions, Tilopa putting his experiences into song, answered each question in this way. It is said that many of those who realized the meaning of the songs attained siddhis. Thus he became renowned as the Siddha Tillipa, and is one of the eighty-four mahasiddhas of India. 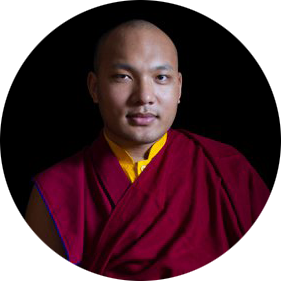 After many years of benefiting beings and guiding his disciples for a long time, he departed for the enlightened realms without leaving his physical body. His two most well known students were Naropa and Lalitavajra. His Golden Rosary lineage heir was Naropa.